Credit: Image courtesy of Irene Cortese, M.D. 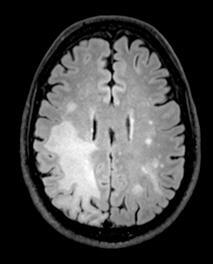 The anti-cancer drug pembrolizumab has shown promise in slowing or stopping the progression of progressive multifocal leukoencephalopathy (PML), a typically fatal infection of the brain caused by the JC virus (JCV). This finding comes from a small-scale study by scientists at National Institute of Neurological Disorders and Stroke (NINDS), part of the National Institutes of Health. The study appears in the New England Journal of Medicine. Pembrolizumab blocks the interaction between two proteins, PD-1 and PD-L1. Normally, these proteins work by putting the brakes on the immune system to limit excessive inflammation. However, some tumors that have PD-L1 on their surface can exploit this “off switch,” limiting the immune system’s ability to attack the cancer. Recent studies of PML patients have suggested that this mechanism may also be involved in JCV brain infections. Eight patients at the NIH Clinical Center, all of whom had signs of worsening PML, were treated with pembrolizumab. The status of their infection was monitored by MRI scans of their brains and by checking the levels of JCV in their cerebral spinal fluid (CSF). In five of the eight patients, the amount of circulating virus was reduced following treatment with pembrolizumab. Importantly, these patients’ symptoms improved or stabilized, and their brain MRIs showed shrinking of infection-related brain lesions. JCV is a common and usually innocuous virus that normally resides in the kidneys of anywhere from one- to two-thirds of the population. Rarely, in patients who have had their immune system suppressed due to conditions such as HIV/AIDS or because of immunosuppressive medications such as many cancer therapies or some treatments for autoimmune diseases, JCV can change to a form that infects cells in the brain. These infections are what causes PML, which can lead to a variety of symptoms including clumsiness, progressive weakness, and changes in vision, speech, and sometimes personality. Currently, researchers are working on discovering markers for individuals at high risk for PML and for earlier detection of infection. Larger clinical trials conducted under more controlled conditions are necessary for a better understanding of the effect of pembrolizumab or similar medicines on PML, and work is currently underway to determine the best way to take those next steps. This study was supported by the Intramural Research Program of NINDS/NIH. NINDS is the nation’s leading funder of research on the brain and nervous system. The mission of NINDS is to seek fundamental knowledge about the brain and nervous system and to use that knowledge to reduce the burden of neurological disease. About the National Institutes of Health (NIH): NIH, the nation’s medical research agency, includes 27 Institutes and Centers and is a component of the U.S. Department of Health and Human Services. NIH is the primary federal agency conducting and supporting basic, clinical, and translational medical research, and is investigating the causes, treatments, and cures for both common and rare diseases. For more information about NIH and its programs, visit http://www.nih.gov.